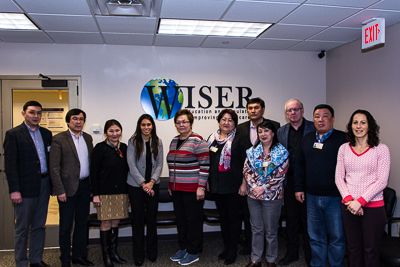 Recently, WISER hosted a group of delegates from the University Medical Centers (UMC), a collection of hospitals associated with Nazarbayev University in Astana, Kazakhstan. The delegates were participating in a program organized through UPMC International that provides key physicians and administrators � notably chair-level physicians and some of the highest level of executives such as hospital presidents, vice presidents and leaders of different functional areas � with access to evidence-based clinical and management principles and solutions. The program included one week of management-intensive training, focused on themes of clinical department and service line management (quality, operations, strategy, human resources, etc. ), followed by two weeks of customized observership programs and meetings according to their area of sub-specialization. On their last day of the program, the delegates spent a morning at WISER touring and learning about best practices in healthcare simulation, education, and operations. It is always a pleasure working with UPMC International and the delegates from this program!